Can a weakly conceived and poorly executed exhibition be unforgettable? That is how I would describe my reaction to “Art at War”—“L’art en guerre: France 1938-1947”—the big show about French art during the German Occupation that I caught on the day it was closing in Paris; it opens next week at the Guggenheim Bilbao, where it runs through the summer. The crush of visitors who had come to see “Art at War,” installed in the old Museum of Modern Art on Avenue du President Wilson, only added to the hair-raising mood in the galleries. The German occupation of Paris precipitated an extraordinary confrontation between the city where modern art was born and the regime that was determined to shatter modernity. The juxtapositions in this exhibition are harrowing. We are asked to take in both the luxuriantly sensuous visions of Henri Matisse and Pierre Bonnard, living in relative safety in Vichy France, and the stark, hardscrabble images done in detention camps by Charlotte Salomon, Otto Freundlich, and Felix Nussbaum, who would soon perish in the German death machine. If it is a story in which the moral giants are outnumbered by the moral pygmies, it is also a story that raises the gravest questions about the morality of art and the artist’s obligation to society. Charlotte Salomon, Untitled (4917), 1940-1942. That the show, organized by Laurence Bertrand Dorléac, is not coming to America is not surprising. American museum directors may well wonder what any of this has to do with us. Perhaps only during the darkest days of McCarthyism did Americans have to confront at home such stark choices about artistic, intellectual, and moral responsibility—and even then, Americans were rarely if ever confronting matters of life and death. In the United States the responsibility of the artist is more often than not an abstraction, detached from harsh realities. And yet when I asked friends in Paris whether there had been much of a debate about the show in the press, nobody recalled any especially serious or substantive discussion, which may only indicate that intellectuals do not regard art museums as places where matters of moral responsibility can be seriously aired or adjudicated. In recent decades there has certainly been a good deal of scrutiny of the choices artists and writers made during the war, most recently with strong debates about the depth and significance of Gertrude Stein’s infatuation with Hitler and Marshal Petain and the circumstances that enabled this middle-aged Jewish woman and her companion, Alice B. Toklas, to remain safe in France.1 There can be little doubt that the old view of Stein as an American hero, joyfully welcoming American GIs to her Parisian home after the war, is in need of some readjustment, but I do not necessarily think that Stein’s Fascist sympathies ought to lead to a full-scale revaluation or devaluation of her literary gifts, such as they are. It has often been said, and not without good reason, that authoritarian regimes on the Left and the Right attack artists and intellectuals because they see them as freethinkers who pose a grave threat to their authority. By the time I left “Art at War,” however, I found myself wondering if the Nazi impulse to crush—or at least turn to its own advantage—artistic life in France was simply one more aspect of their determination to transform every aspect of the world. Could it be that artists and intellectuals find it soothing to think that they are the particular enemies of authoritarian regimes? In Paris I bought a book of reflections, Journal atrabilaire, by the curator and critic Jean Clair, who has a reputation in France as a brilliant, energetic, and irascible critic of the artistic status quo, roughly paralleling Robert Hughes’s reputation in the United States. At the beginning of the book, Clair finds himself reflecting on the fact that of the two men who nearly destroyed Western civilization—the civilization whose art and literature were so inextricably tied to Paris—Stalin had never visited the city and Hitler had toured the city for no more than a couple of hours. I was struck by this thought in the context of “Art at War,” because the agony of the exhibition is not only in what the war did to art and to artists, but in our awareness that the Nazis cared nothing for art itself but only for their ability to annihilate it or control it. What is so wrenching about “Art at War” is that art’s “way of happening” is always at cross purposes with what is happening in Europe. The exhibition includes a section about the Surrealist artists and writers, including Max Ernst, André Masson, and André Breton, who amused themselves with tarot cards and other games as they waited in the South of France to find an escape route from Europe, knowing all the while that their lives hung in the balance. In some sense the Surrealists’ ideas about the explosive nature of unconscious impulses and desires had prepared them for the calamities of the war years, but one is left wondering what an idea about violence—or a fascination with violence—can signify in the face of violence itself. Many of the Surrealists were lucky—they found a safe haven in the United States—and so violence could remain for some of them an idea, separate from the realities of the Holocaust and the annihilation of artists who could find no way out. I have deep reservations about an exhibition in which we are asked, simultaneously, to consider the human cost of the war and to judge the artistic value of works created at the time. An exhibition that raises a barrage of interrelated moral, ethical, and aesthetic problems can feel rather melodramatic, at least in this instance, when there is little serious attempt made to grapple with such problems. What are we to make of those who helped to keep galleries and museums open in Paris during the Occupation? If serious, independent artists who somehow fit the Nazi’s definition of acceptability chose to exhibit, what are we to think of them? Georges Braque was celebrated in occupied Paris as an exemplar of French purity and thus consonant with Aryan ideals, so does that mean we ought to admire his paintings any less? Perhaps I would like the man more if he had refused to exhibit in Paris, but his paintings, which make nothing happen, remain one of the great happenings in twentieth-century art. 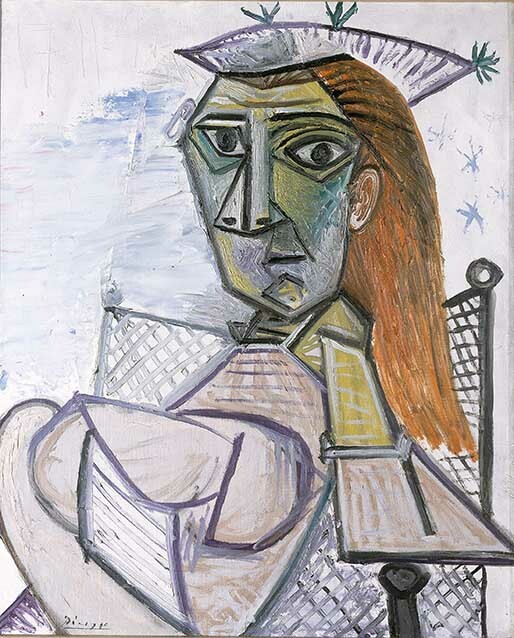 Pablo Picasso, Woman Sitting in an Armchair, 1941. If “Art at War” singles out one person for sainthood, it is surely Picasso, who has a room of his own at the heart of the exhibition, celebrating his solitary labors in his Parisian studio, composing paintings very often in the monochromatic or near-monochromatic palette of mourning. The way Picasso has been positioned in the exhibition is a fascination, at least for those of us who can remember a time when his survival in Paris through the war was regarded with suspicion, suggesting that his relations with the Germans were more comfortable than they ought to have been. By now, after research into police archives from the period, it is clear that Picasso, who continued to support the Spanish Republican cause all through the war, was in more peril in Paris than was once believed. But if the organizers of “Art at War” meant to make of Picasso a moral compass, the singularity of his position in Paris leaves me feeling that once again Picasso has proven to be a law unto himself, less a hero of his time than the hero of his own story. (Perhaps the same can be said of Auden, who chose to spend the war in America rather than in England, where his countrymen fought against such enormous odds to preserve the freedoms he cherished.) Although “Art at War” surely has its flashes of nobility, in the end there is nobody who stands out as a towering hero. Hitler’s inexorable war and propaganda machine makes everything look small, even, sad to say, the art. No wonder that in 1939 Auden believed the best he could say for poetry was that it “survives.” So it was with painting, which was helpless to change the world and could only continue to be itself. Of course that is no small thing. See Barbara Will's recent book, Gertrude Stein: Modernism and the Problem of "Genius."